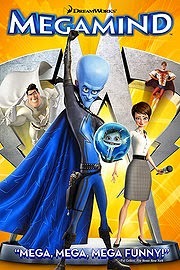 Home / 5 stars / Movie Review / Movie Review--> Megamind ~ A blue, bad and brilliant villain to the rescue? 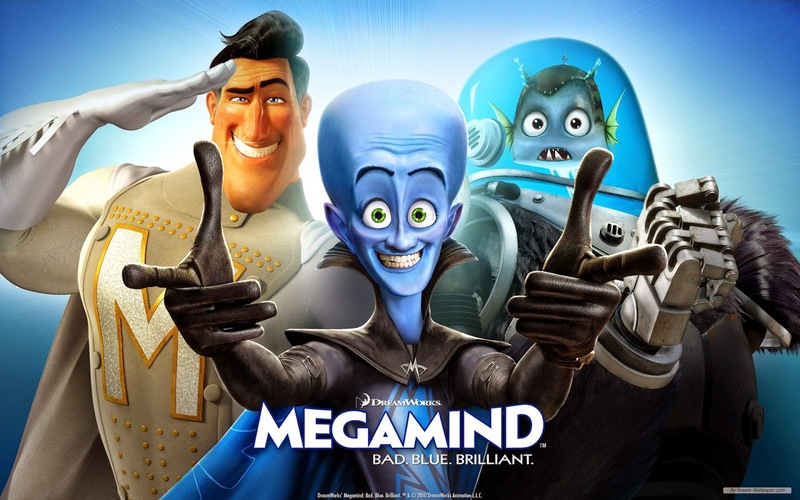 Movie Review--> Megamind ~ A blue, bad and brilliant villain to the rescue? With these lines Megamind came alive on the screen and slowly made it into my favorites. 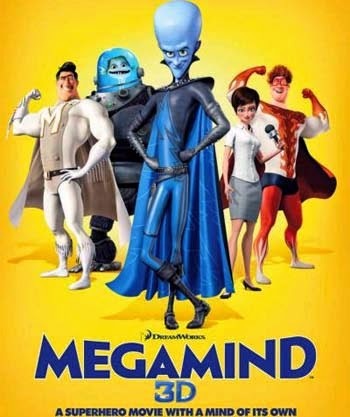 Megamind released in 2010 and while at first I was apprehensive about it but after watching the movie I was a big fan of the film and everything about it! 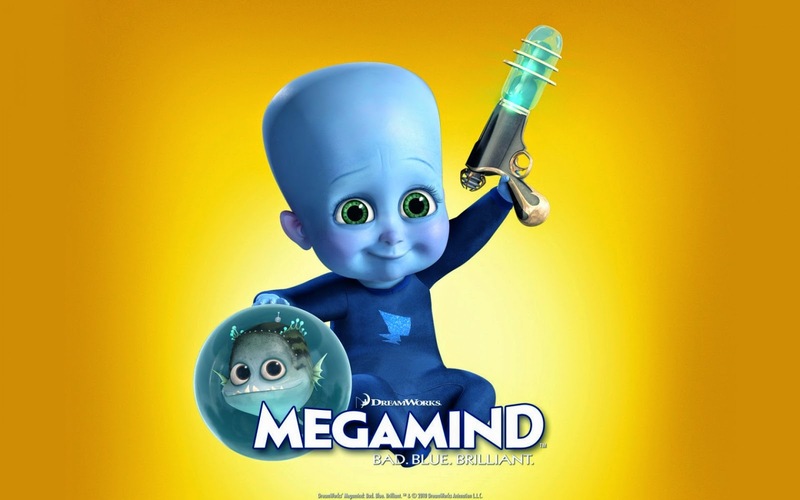 Megamind is bad and wants to become the baddest of all villains. His arch enemy, Metroman is facsimile of Superman. Both Megamind and Metroman were launched from their own dying planets to earth just like Superman and while Megamind is dropped among criminals, Metroman is raised with a silver spoon in his mouth. "Could this be what I was destined for? A dream life filled with luxury? Apparently not! Even fate chooses its favourites..."
All through his childhood while Metroman is praised and loved, Megamind, howsoever, he may try to be good, always ends up being a villain! Soon it is clear to Megamind that he will always be an outcast and the only thing he is good at is being a villain! "All men must choose between two paths. Good is the path of honour, heroism, and nobility. Evil... well, it's just cooler." With this earth shattering realization, Megamind, the super villain is born and his epic battles with Megamind! "No matter how hard I tried, I was always the odd man out, the last one picked, the screw-up, the black sheep... the bad boy. Was this my destiny?... Wait. Maybe it was! Being bad is the one thing I'm good at! Then it hit me: if I was the bad boy, then I was going to be the baddest boy of them ALL! I was destined to be a supervillain, and we were destined to be rivals! The die was cast! And so began an epic enduring lifelong career... and I LOVED IT! Our battles quickly got more elaborate. He would win some, I would ALMOST win others! He took the name: Metro Man, defender of Metro City. I decided to pick something a little more humble: Megamind, incredibly handsome criminal genius and master of all villainy!" Although the movie looks like a classic tale of two super aliens, it is mainly about Megamind and his journey of finding his true calling. Everything from dialogue, settings, effects, character voices, the storyline, direction, editing etc. are all just perfect. I loved the voices of Will Farrell as Megamind, Brad Pitt as Metroman, Tina Fey as Roxanne Richi (the reporter) and David Cross as Minion (Megamind's best friend), Justin Theroux as Bernard etc. beautifully lend these animated characters a life. Despite his unusual looks, Megamind symbolizes the average person who has atleast once in his lifetime felt out-of-place, been rejected by someone and felt inferior to someone. His struggles to gain acceptance are just like the ones we may have faced sometime in our lives. This is the first movie that made me root for the villain. I just loved Megamind with his brilliant mind, funny accent, a good heart and his best efforts to become a bad, scary villain which often ended being funny! His friendship with Minion is endearing and will make you remember your own best friend. They have faced everything together and are devoted to each other. Minion with his more practical mind is the one keeping Megamind connected to reality. He is devoted to his friend and ready to do anything for him and when he said, "My sole purpose in life is to look after you!" he just won my heart! Roxanne Richi's character is the facsimile of Lois Lane in Superman. She worships Metroman and is a big fan. Her blind faith in Metroman and her interactions with Megamind were sometimes funny, sometimes emotional but always very entertaining! Metroman is not a major character in this movie. He has always had praise, acceptance and the love of the people of Metrocity but is he satisfied with this? 1) "I guess destiny isn't the path chosen for us, but the path we chose for ourselves." 2) All men must choose between two paths. Good is the path of honour, heroism, and nobility. Evil... well, it's just cooler. 3) There's a benefit to losing: You get to learn from your mistakes. 4) there's a yin for every yang. If there's bad, good will rise up against it! 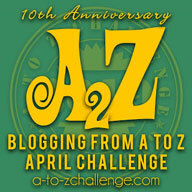 5) What's the use of having it all, if there's no one around to stop you? 6) we never really know how good you have it until it's gone. 7) You don't judge a book by its cover or a person by the outside...You judge them by their actions.